October has proven to be a busy month, as the third LAN of the new season gets underway. The Nanyang LAN – the biggest tournament in the Southeast Asian region – will take place between October 26th – November 1st, at the Suntec Convention and Exhibition Centre, in Singapore. Ten teams – six invited and four qualified ones – will compete for the $214,088 prize pool. For CDEC, Team Secret and Virtus.Pro, this will be their third LAN in the span of one month. Other teams – such as EHOME, ViCi Gaming, Mineski, Team Liquid, and Digital Chaos – will be making their LAN debut. The Nanyang LAN has a base prize pool of $200,000, which has been slightly increased by crowdfunding. 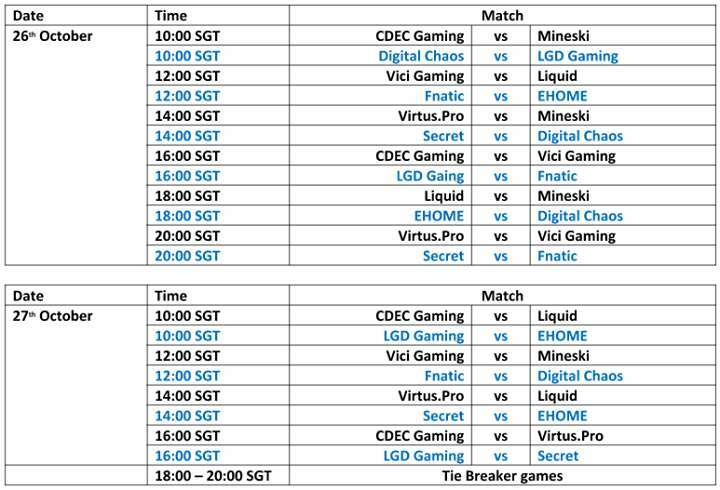 The ten-team lineup consists of six direct invites – Fnatic, Virtus.Pro, Team Secret, ViCi Gaming, LGD Gaming and CDEC – as well as four qualified squads –Digital Chaos* (Americas qualifiers runner-up), EHOME (winner of the Chinese qualifiers),Team Liquid (winner of the European qualifiers) and Mineski (winner of the Southeast Asian qualifiers). *Cloud 9 were forced to pull out of the Nanyang LAN, due to Theeban “1437” Siva’s lack of time to sort out travel requirements. Cloud 9 will be replaced by the regional qualifiers’ runners-up, Digital Chaos. When it comes to the format, the event will start out with a classic Round Robin group stage. The ten teams have been split up into two groups of five an will face each other in two-game series. Based on the number of points accrued during the group stage (three points for a win, one point for a draw and zero points for a loss), the top two teams in both groups will be seeded into the Upper Brackets of the playoff stage, while the teams placed third and fourth will begin the playoffs in the Lower Brackets. The last place team in each group will be eliminated. The playoffs stage will be a double elimination bracket, first two rounds of the Lower Brackets being the brutal best-of-one series and all other matches being best-of-three series. The Grand Finals will be played as best-of-five series with no Upper Bracket advantage. 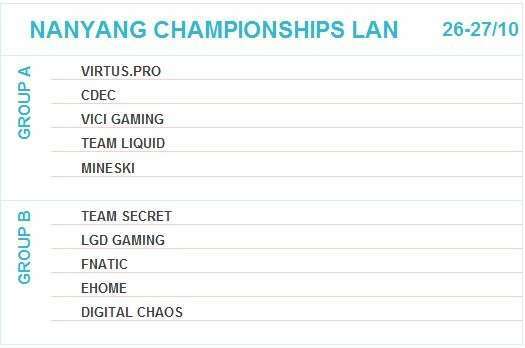 The Nanyang LAN will mark the third LAN tournament in only one month for Virtus.Pro, Team Secret and CDEC. Will three tournaments on two continents in one month prove to be too exhaustingor will the experience act in Team Secret, CDEC and Virtus.Pro’s favor at the Nanyang LAN? Since they found stability in the spring of 2015, Virtus.Pro have had top three finishes in numerous major tournaments in the months leading up to The International 5. They then came in a commendable 5th-6th place at this year’s International, as they managed an unexpected performance when they saw odds-on favorites Team Secret eliminated. They were one of the few teams to keep their rosters intact at the height of the post-TI5 reshuffle period, but have struggled to progress further than the quarterfinals in the last two LAN events, coming in 7th at ESL One New York and 5th at the MGL World Finals. CDEC has been a true Cinderella story in the making, going from rags to riches in a surprisingly short period of time. Without a single championship title under their belt, they became the first Wild Card team that has ever advanced into The International Grand Finals. The young Chinese players have decided to stick together post-TI5. They have proved that they are able to adapt quickly, continuing to play in their own aggressive style, littered with great individual skill and masterfully coordinated rotations. People might have expected a bit more from CDECduring the beginning of the new season, but let us not forget that they are still a relatively new and inexperienced team and that they have accomplished a lot in their short period of time together. CDEC continue to be consistent and dependable. They came in third at ESL One New York, after being eliminated by a very vigorous Team Secret in the semifinals, and then third-fourth at the MLG World Finals, after falling to Evil Geniuses. Out of Virtus.Pro, CDEC, and Team Secret, the latter have definitely had a fantastic start to the new season. 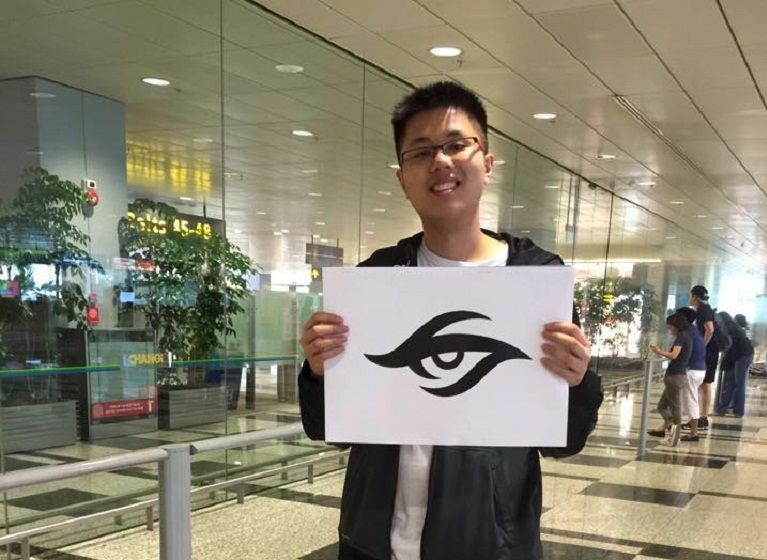 After a disappointing eighth place finish at TI5, Team Secret announced a completely revamped roster on August 22nd. Since Clement “Puppey” Ivanov is the only original member on the current roster, the fact that Team Secret received numerous direct invites, without having to prove themselves first, brought forth much debate. However, they quickly put to ease any questions with their dominating presence and impressive performances. They finished second in their LAN debut, at ESL One New York, and managed to seize the MLG World Finals championship title. They arrived early in Singapore to adjust to the time-frame changes, so they are expected to show up in top form. The new EHOME roster has been turning heads and making waves in the Chinese region. Qualifying for back to back events (ESL One New York and the Nanyang LAN Finals), EHOME has been breathing a renewed sense of life into their performances. They were forced to pull out of the ESL One New York LAN due to visa issues, so they haven’t had the chance to demonstrate their full strength in a LAN setting yet. The Nanyang LAN will be their first opportunity to do so. LGD Gaming is another Chinese powerhouse that has undergone significant roster changes after The International 5. 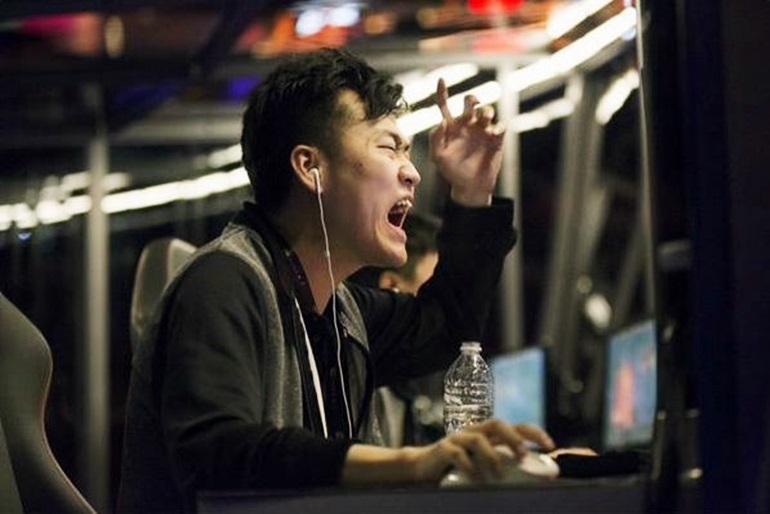 In fact, it will be very interesting to watch them face EHOME in the Nanyang LAN group stages, since EHOME’s former captain, Fan“rOtk” Bai, and player Liang “DDC” Faming have both joined LGD Gaming during the post-TI5 shuffle, when Zhang “xiao8”Ning and Yao “Yao” Zhengzheng stepped back from the active roster. LGD’s new roster had a rather lackluster start to the season. They came in 7th-8th place at the MLG World Finals, falling into the last place in their group stage, after having lost to both Virtus.Pro and Evil Geniuses – two teams that haven’t particularly shined to their full potential this season. LGD will need to step up their game in order to redeem themselves during the Nanyang LAN, but the short amount of time between MLG and Nanyang and the significant travel logistics have not given them much opportunity to adjust and practice. ViCi Gaming – who will make their LAN debut in Singapore,will undoubtedly be one of the most expected appearances. Despite placing high at TI5, ViCi Gaming were forced to replace Chen “Hao” Zhihao with Xu “BurNIng” Zhilei, when Hao decided to return to Team Newbee. The rest of the roster remained intact, including the tight knit support duo of Xu “fy”Linsen and Lu “Fenrir” Chao. The Chinese giants have not played with BurNIng in a LAN setting yet. All the members have undeniable talent and experience, it will be interesting to see what they are capable of together. In the post-TI5 shuffle, Team Liquid (formerly 5Jungz) appeared on the horizon demanding attention. They walked away with their first victory only two weeks after their initiation, in the Alienware Summer’s End Cup Grand Finals and qualified for the Nanyang LAN. 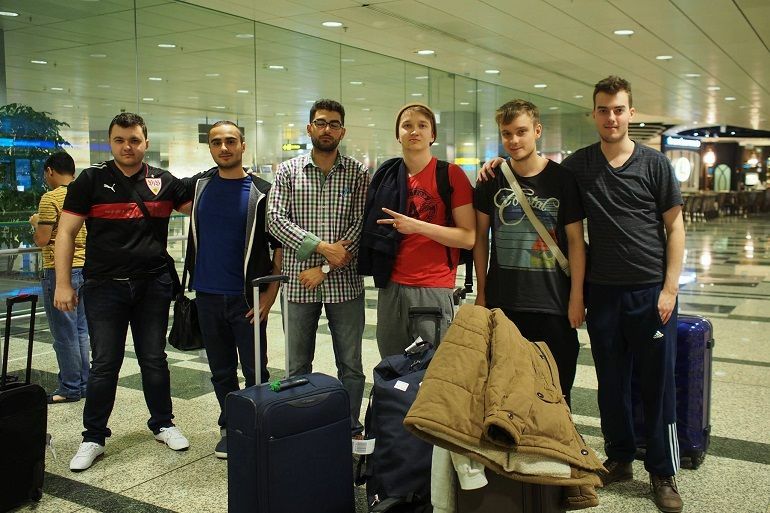 They were expected to be one of the front-runners in the Frankfurt Major Regional Qualifiers. After the first two days, they were looking incredible and sitting at the top of their group. However, they were easily knocked down to the Lower Brackets by (monkey)Business and then eliminated by Alliance. Team Liquid will make their LAN debut in Singaporeand they have a lot to prove after a series of mixed performances. Seasoned Dota 2 stars Aui_2000, BuLba and TC have been trying out their luck in the new season alongside up and coming players YawaR and Biryu, on a brand new team, Digital Chaos, founded by SUNSfan. Although the team’s online presence has been noticeable, they haven’t really had the chance to go up against teams from different regions and they have been struggling to attain the top position in the NA region, always remaining one step backward, under Cloud 9’s shadows. Having secured their spot at the Nanyang LAN finals as the runner-up team when Cloud 9 were forced to withdraw after travel document issues, Digital Chaos will have their first shot at proving themselves in a LAN setting. Following The International 5, Fnatic made significant changes to their roster, with Mushi and Ohaiyo being the only remaining members. Changing directions, the team is now infused with an international flavor, with Djardel “DJ” Mampusti from the Philippines and Dominik “Black^” Reitmeier from Germany on the squad. The team has been trying to find their way, balancing out the differences in play-style and communication most likely. They were eliminated in the ESL One New York quarterfinals and took the runner-up spot in the Frankfurt Major SEA Qualifiers, coming in behind the team that has been showing the most promise in the region, Mineski. Having a few weeks of practice and the advantage of not having to travel very far, the team may have benefited from the time to work on their weaknesses and solidify as a group, honing in on their strengths. This seems to have been the year of the underdogs. CDEC made history at TI5 with their shocking success story and Vega followed suit with a similar journey, at ESL One New York. Now, Mineski are hoping to capitalize on that trend and be the next in line to create an inspiring story. They have already taken the first steps on that path. After many reshuffles, the last roster change came in August, when the team added Ryo “ryOyr” Hasegawa, formerly of Rave Dota. They then qualified for the Nanyang LAN and then upset Fnatic to claim the first spot in the Frankfurt Major SEA Qualifiers.